Almirante is a city in the Caribbean West of Panama. 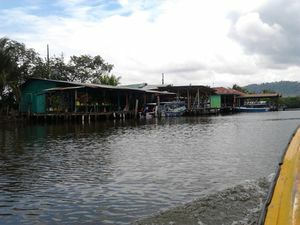 The town is the main departure point for water taxis going to Isla Colón and Bocas town. There are public buses arriving from David. Journey time is approximately 5 hours and costs $11. If you suffer from travel sickness, the journey will be difficult. Buses also available to Chiriqui Grande. The journey from Panama City takes around 11 hours and costs ca. 29$. There are 3 night express buses and they often sell out very quickly. There are 2 options to ensure your spot on the bus you want - 1) go to Albrook Bus Terminal early in the day to buy your ticket in advance, or 2) use the Panama Bus Tickets service (https://www.panamabustickets.com) to reserve your seat without having to make an extra trip yourself. The ferry dock is approximately 2kms from the bus terminal. It is possible to walk, but for $1 you can take a taxi, which is well worth the expense. Ferry trip to Colon Island takes around 2hrs. Usually departs at 8AM sharp and returns 5:30PM. There is little to see in the town itself. English creole also spoken in the town. a 10 minutes drive, from there you have a beautiful seaview of the bay. There is a supermarket next to the bus terminal. Casa Rosada Hardware Store and General supplies. BNP National Bank branch with the only ATM available in town. Town is famous for "Journey Cakes", bread made with coconut flavor; hot-meat patties and plantain patties. Spicy fried chicken with fried plantains is a popular night meal. Chinesse restaurants are available in town. If you cant afford pay for the Ferry vehicles fare, you could leave your car at Aida´s Garage House for a small fee, safe and protected at 507-66598914. She also could get you a place to sleepover if you get stranded in town. The Changuinola bus station is located mid-town, 500m from the water taxi docks, $1.25. Buses depart every 20 minutes from 5:30AM to 9:00PM. A shared taxi to Guabito-Sixaola border is also available, price range $5 to $10 per person. Walk 2km to David/Panama City Bus station/$1 taxi. This page was last edited on 20 July 2018, at 22:09.